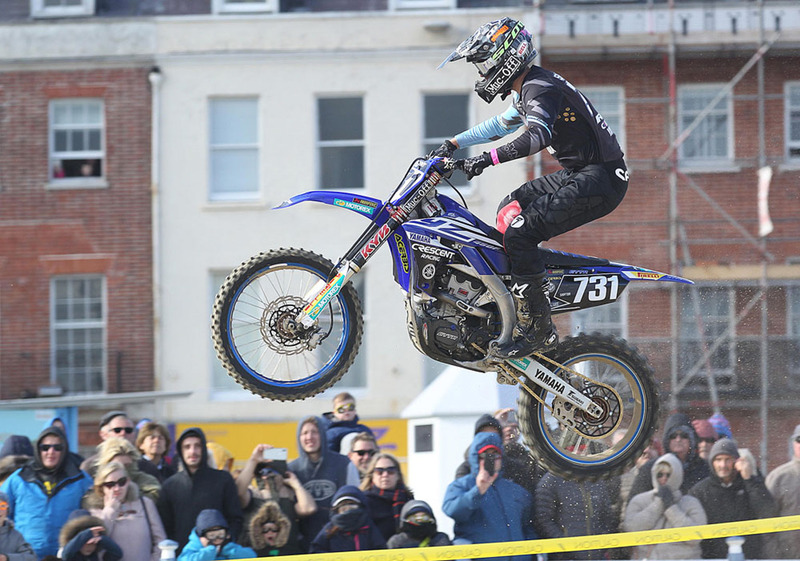 Motocross ace Jamie Carpenter defeated a line of top entries like Jake Shipton and world enduro champ Steve Holcombe in the 2018 staging of the AMCA Beach Motocross at Weymouth. 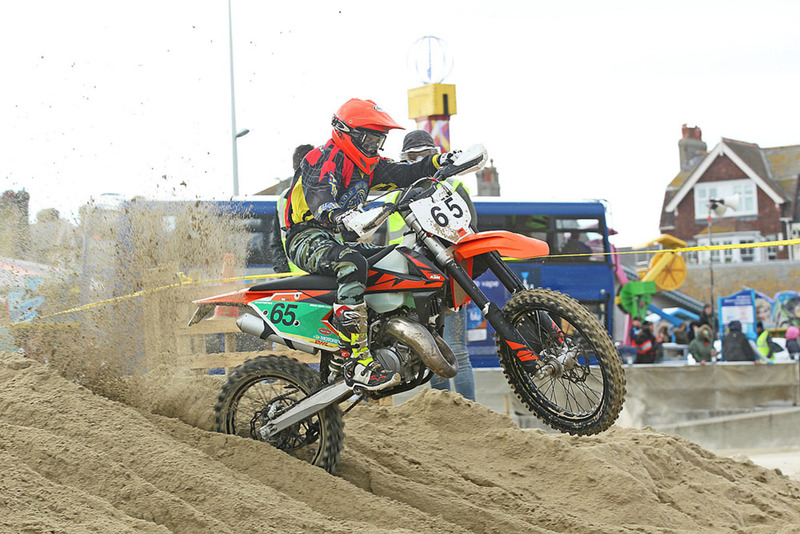 The event was to prove extra special for Alf Stearn, chairman of the organising Purbeck MXC. 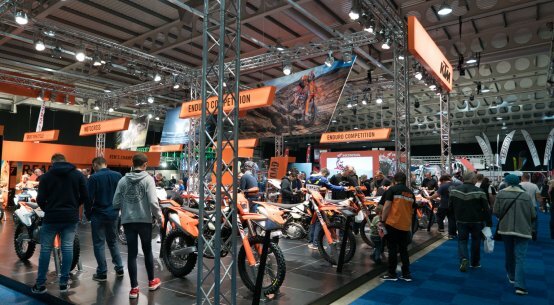 Not only was this Alf’s 25th year of being involved in the event but also the 2018 entry was to be at its biggest ever, with a whopping 364 riders in attendance! And it’s easy to see just why this immensely popular event has survived the times of change and continues to go from strength to strength! 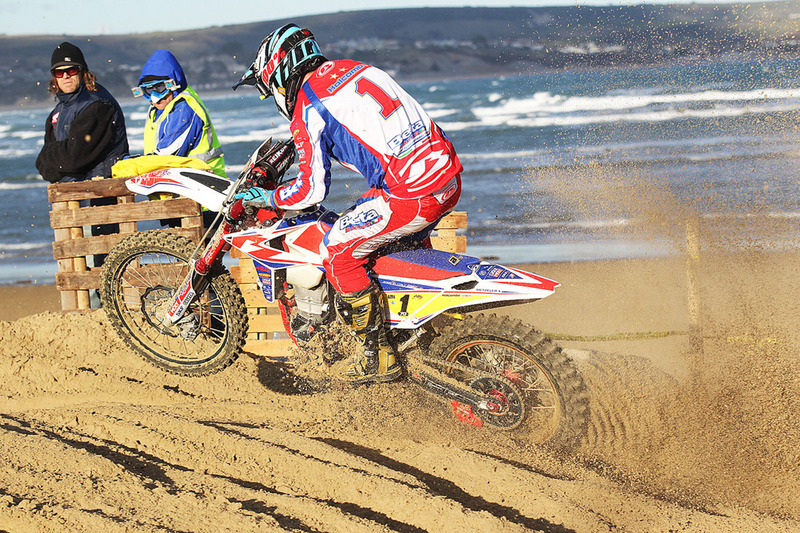 The small but totally committed, organised and enthusiastic Purbeck club run a very slick show, building a track which caters for riders of all abilities but most importantly make the event totally enjoyable and good fun for everyone! 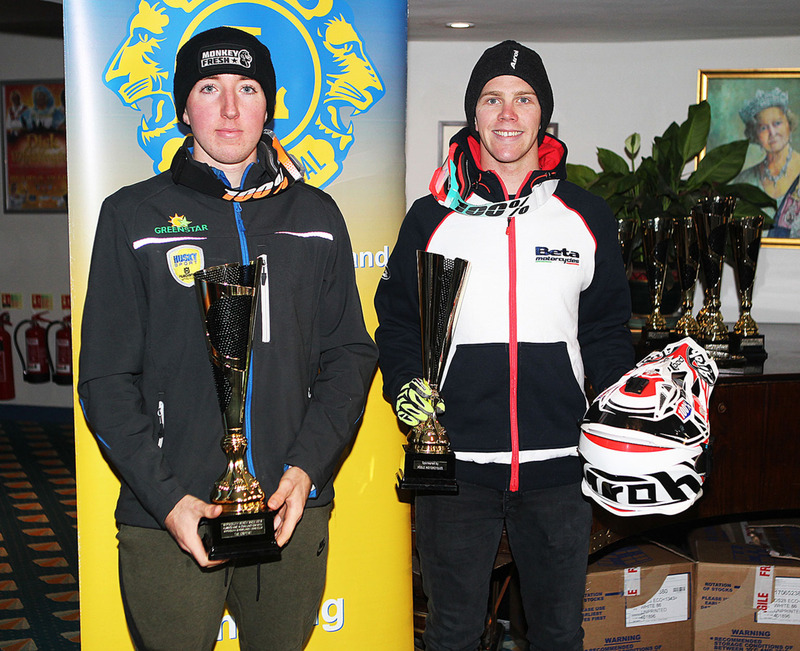 Although a bitterly cold and strong wind tried its best to interrupt proceedings on Sunday, a big crowd was again in attendance and watching the action for FREE as Robbie Shuttleworth (Juniors), Billy Saunders (Seniors) and James Carpenter (Experts) took the overall wins. First up was the Juniors Unlimited contest sponsored by Caroline Racing and it was the high flying Brett Rowland on his little 2T KTM who posted the fastest time in practice. But when the legendary Weymouth starter Mr Jim Shipton dropped the flag to signal the commencement of the 2018 Junior contest it was to be Lee Sims who led the long charge to the first turn. Showing the speed he had generated earlier in the day, Rowland then quickly responded by taking control at the front until disappearing from proceedings on lap four. Replacing Rowland at the front was Robbie Shuttleworth who initially started down in 7th. For the final two laps Shuttleworth then remained calm to guide his KTM home to victory as Michael Norton took 2nd from Luke Humphries, Andrew Hollingsworth, Dave Thomas and Ryan Fox. 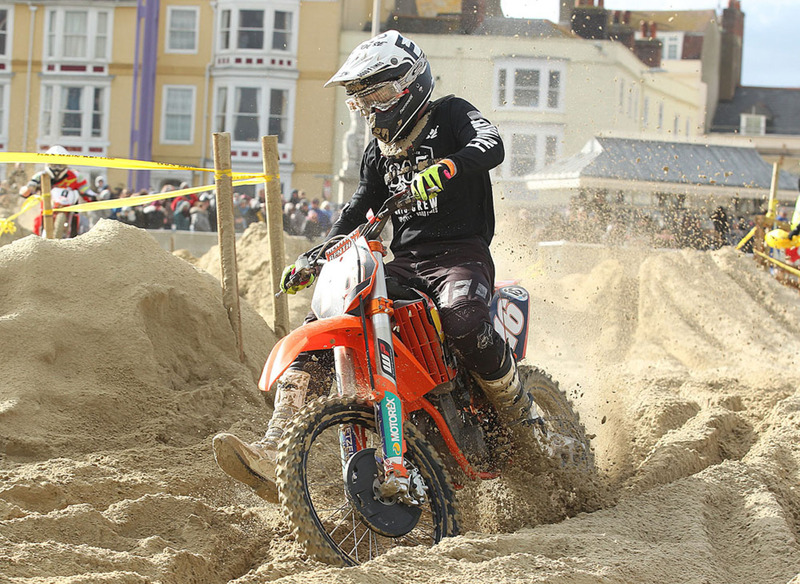 In a frantic opening Seniors moto, Mark Morris grabbed the holeshot before disappearing totally off the leaderboard. Next up to enjoy a brief taste of race leadership was Kyle Proctor before Ross Blackmore came storming through. Gating in 10th, Ross was on a right charge and after taking control on lap three he then raced off to take what was to be the narrowest of victories! Right on his tail was Billy Saunders who had also moved swiftly up the leaderboard. At the chequered flag and after nine crazy laps, Saunders was incredibly less than a single second behind Blackmore, what a finish! Next up was Robert Lewis, Proctor and Scott C Aylmore who had posted the fastest practice time. 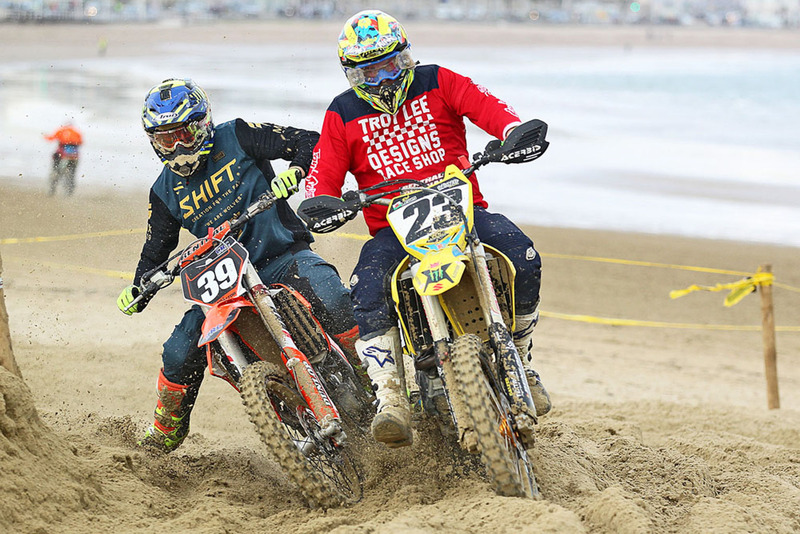 After that extremely close finish, the roles were to be reversed in moto two as Saunders got the better of Blackmore, the winning margin on this occasion being slightly more comfortable. Proctor had led the early stages of this second clash, eventually having to settle for 4th behind Lewis. For this Welsh lad, moto two was certainly eventful, getting up to 2nd before colliding with a backmarker and dropping initially down to 5th. 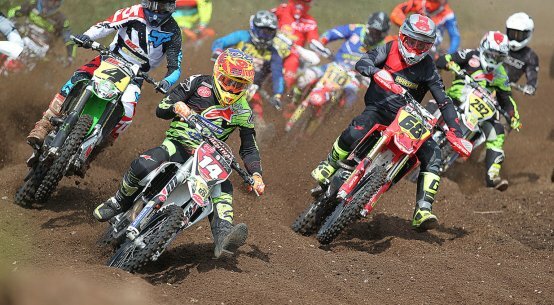 On his fast Honda, Aylmore was again right in the mix as Owen Hillman, Jamie Watts, Tallon Aspden, Mark Cornick and Ricky Good completed the top ten. 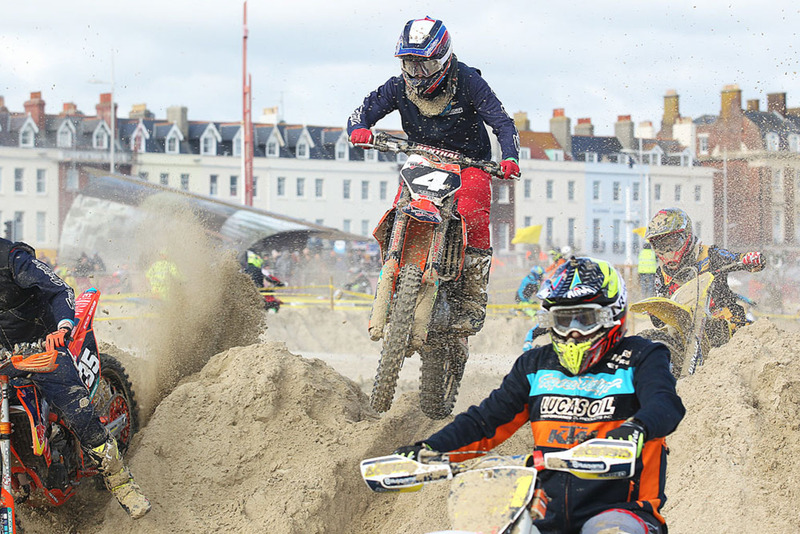 Once again at Weymouth, Poole Motorcycles were kind enough to sponsor an Experts contest stacked with quality and it was former Weymouth winner and current ACU Maxxis Championship runner Jake Shipton who laid down an early marker by posting the fastest practice time. 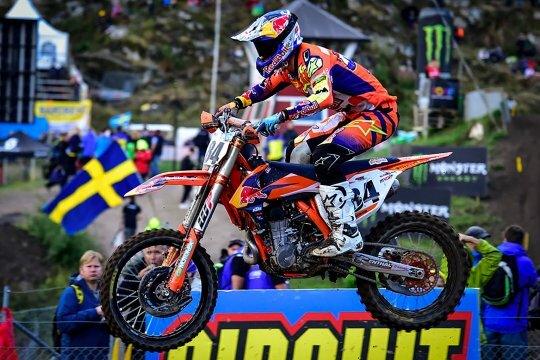 Local favourite Shipton then made a simply blistering start in moto one to thus lead the way but fellow Maxxis Championship rider Jamie Carpenter was right on his tail. Four laps in and Shipton unexpectedly tasted the Weymouth sand thus enabling Carpenter to take control. For the next six laps it was now Jake’s turn to do the chasing before eventually regaining control on lap ten. 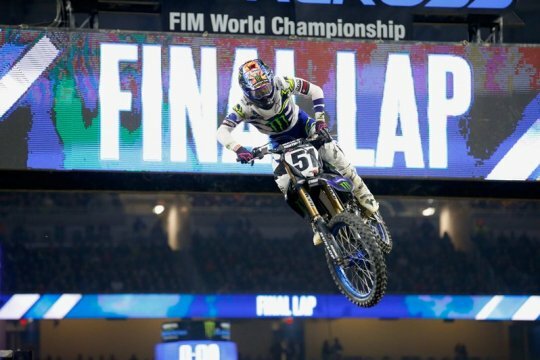 The joy though of retaking the lead was to be unfortunately short lived as Shipton’s Yamaha engine expired signalling the end of his day’s racing. So victory went to a very fast Carpenter. Getting home in 2nd was Enduro ace Daryl Bolter whilst JSR Thunder road Honda AMCA title chaser James Dodd in 4th, Corey Hockey, Luke Oldfield, Gareth Artus, Lewis Dowdeswell, Brad King and Brad Thornhill all produced strong opening race results. 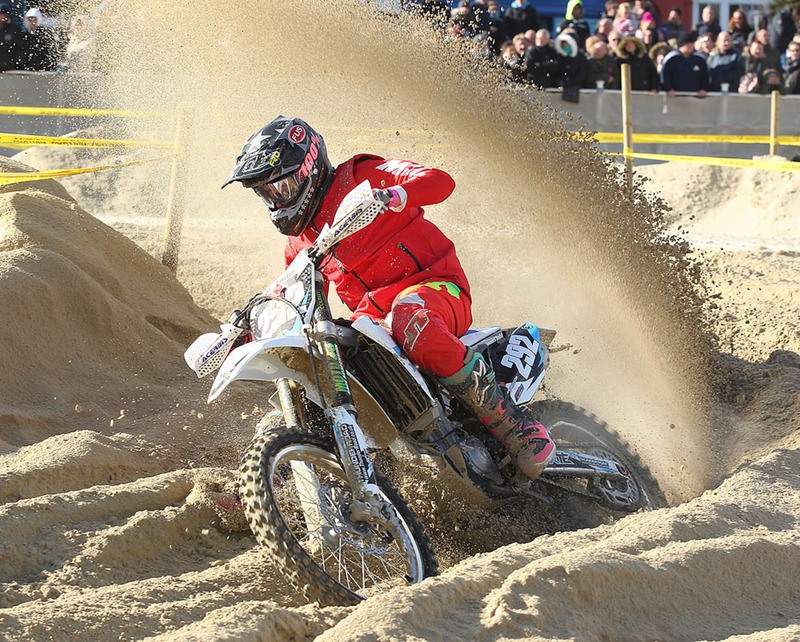 The real stars though of this moto one clash were Josh Waterman and World Enduro Champion Steve Holcombe. Starting at the back, Josh came right through to 3rd despite also encountering more than a couple of tumbles. 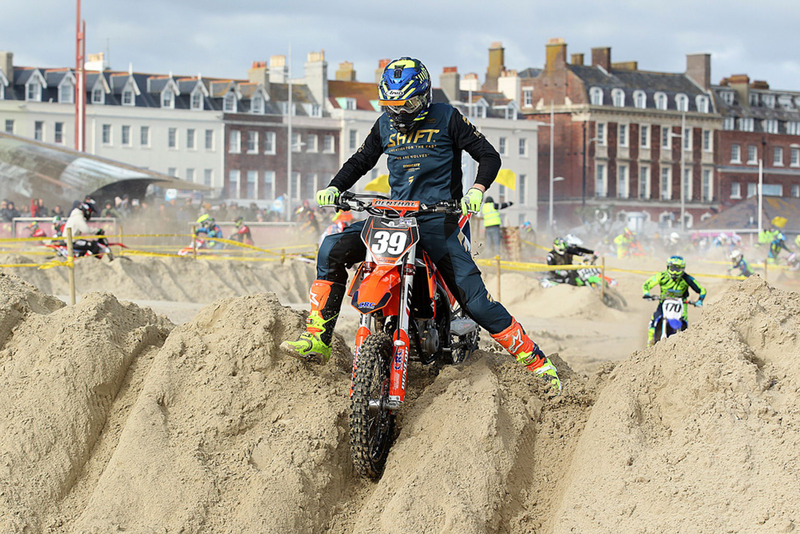 Also in trouble, Holcombe unsure of the procedure to start Weymouth races was left totally stranded on the line and in last place! 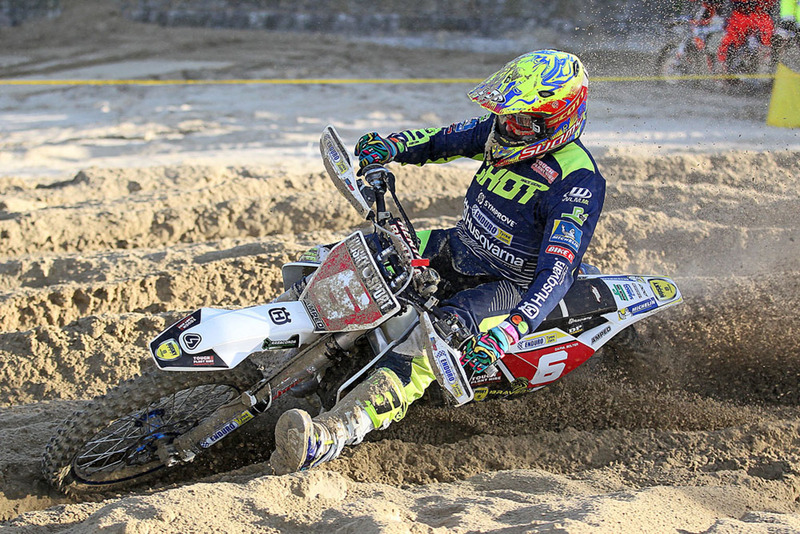 Then pulling a massive wheelie down just about the entire length of the beach race area, Holcombe got down to business and stormed right through the pack to finish 5th! So with Weymouth 2018 done and dusted, all that remained was for Alf Stearn and the Purbeck MXC to hand over a cheque for £1,800 to the local Weymouth and Portland Lions Club. For regular Weymouth commentator Paul Hardy this was to be his last event and Jim Shipton along with his fellow Purbeck members would like to thank Paul and wish him the best of luck in his retirement. Whilst Paul can now put his feet up, everyone else will be back again in 2019, the date for your diaries being Sunday, 13th October. Moto one 1 Robbie Shuttleworth 2 Michael Norton 3 Luke Humphries 4 Lee Sims 5 Connor Rixon 6 Andrew Hollingsworth 7 Joe Sullivan 8 Paul Palmer 9 Rhys Trotter 10 Dave Thomas. 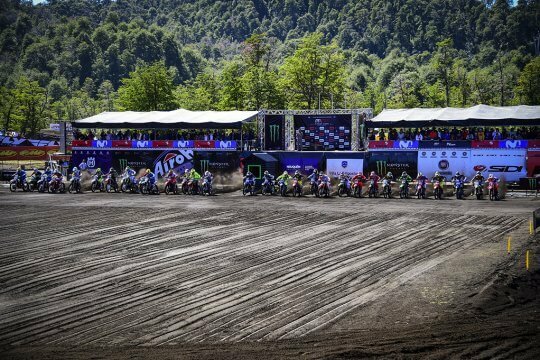 Moto two 1 Brett Rowland 2 Shuttleworth 3 Norton 4 Rixon 5 Harrison Boyd 6 Hollingsworth 7 Adam Moore 8 Sims 9 Morris 10 Connor Jocelyn. Overall 1 Shuttleworth 114 2 Norton 104 3 Rixon 92 4 Hollingsworth 86 5 Sims 86 6 Moore 72 7 Sullivan 68 8 Ryan Fox 66 9 Thomas 64 10 Trotter 63. Moto one 1 Ross Blackmore 2 Billy Saunders 3 Robert Lewis 4 Kyle Proctor 5 Scott C Aylmore 6 Jack Alderton 7 Grant Laming 8 Tallon Aspden 9 Jamie Watts 10 Charlie Enticknap. 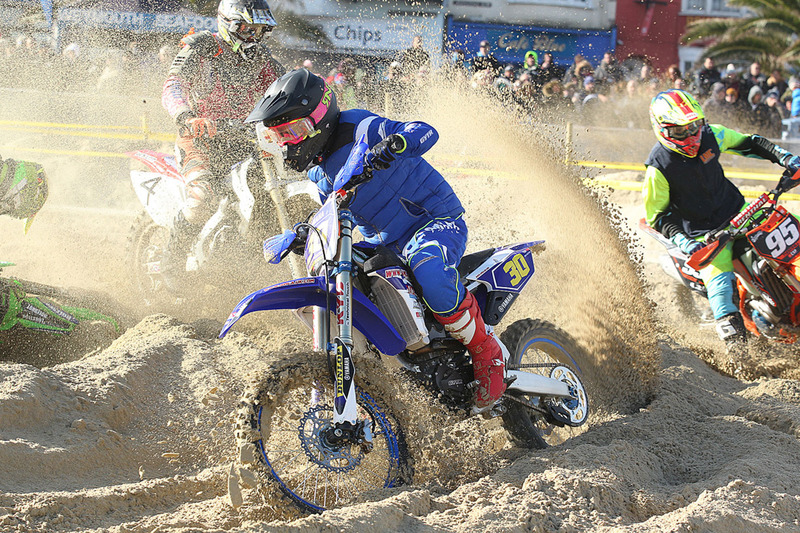 Moto two 1 Saunders 2 Blackmore 3 Lewis 4 Proctor 5 Aylmore 6 Owen Hillman 7 Watts 8 Aspden 9 Mark Cornick 10 Ricky Good. Overall 1 Saunders 114 2 Blackmore 114 3 Lewis 100 4 Proctor 94 5 Aylmore 90 6 Watts 78 7 Aspden 78 8 Hillman 70 9 Enticknap 68 10 Good 66. Moto one 1 James Carpenter 2 Daryl Bolter 3 Josh Waterman 4 James Dodd 5 Steve Holcombe 6 Corey Hockey 7 Luke Oldfield 8 Gareth Artus 9 Lewis Dowdeswell 10 Brad King. Moto two 1 Holcombe 2 Carpenter 3 Bolter 4 Lee Sealey 5 Charlie Putman 6 Hockey 7 Dodd 8 Artus 9 Scott Bentley 10 Harry Linton. Overall 1 Carpenter 114 2 Holcombe 105 3 Bolter 104 4 Dodd 88 5 Hockey 86 6 Artus 78 7 Oldfield 72 8 Putman 66 9 Sealey 62 10 Linton 60.